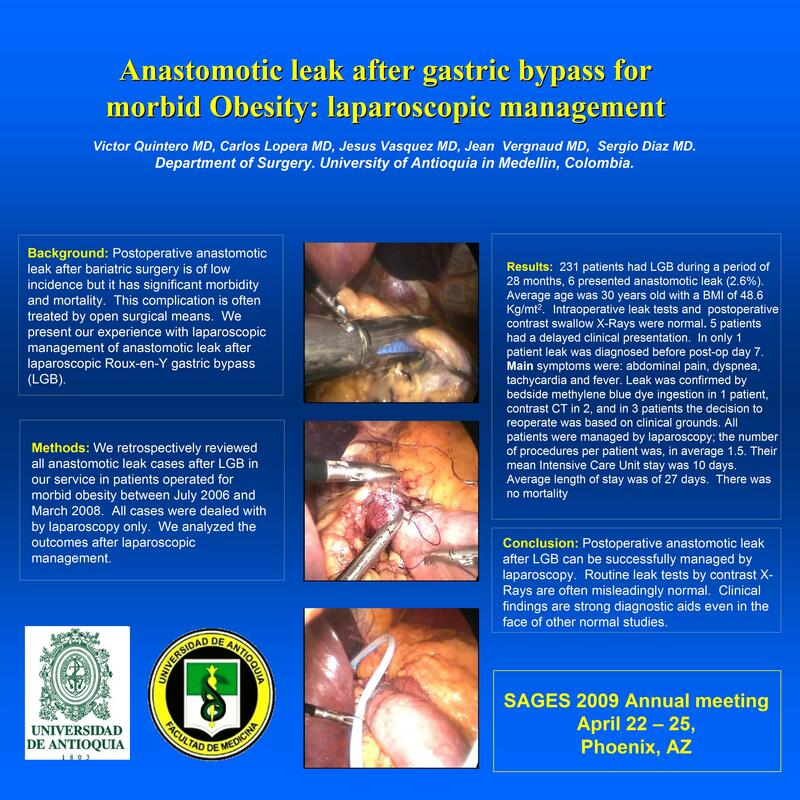 Anastomotic Leak After Gastric Bypass for Morbid Obesity: Laparoscopic Management. INTRODUCTION – Postoperative anastomotic leak after bariatric surgery is of low incidence but it has significant morbidity and mortality. This complication is often treated by open surgical means. We present our experience with laparoscopic management of anastomotic leak after laparoscopic Roux-en-Y gastric bypass (LGB). METHODS AND PROCEDURES –We retrospectively reviewed all anastomotic leak cases after LGB in our service in patients operated for morbid obesity between July 2006 and March 2008. We analyzed the outcomes after laparoscopic management. RESULTS – Among 231 patients undergoing LGB during a period of 28 months, 6 presented with postoperative anastomotic leak (2.6%). Average age was 30 years old with a mean body mass index of 48.6 Kg/mt2. Intraoperative leak tests with methylene blue and routine postoperative contrast swallow X-Rays were normal in all patients. Leak was clinically apparent only after discharge from LGB in 5 patients, and in 1 case it was diagnosed during the first hospital stay. Symptoms causing suspicion of leak were, in order of frequency: abdominal pain, dyspnea, tachycardia and fever. Leak was confirmed by bedside methylene blue dye ingestion (drainage positive in 1 patient) or abdominal contrast CT (2 patients), in 3 patients the decision to reoperate was taken because of the clinical findings. All patients were managed surgically by laparoscopy; the number of procedures per patient was, in average 1.5. Their mean Intensive Care Unit stay was 10 days. Patients required mechanical ventilation for an average of 10 days and the length of stay was of 27 days. Mean duration of leak after laparoscopy was 21 days. There was no mortality. CONCLUSIONS – Postoperative anastomotic leak after LGB can be successfully managed by laparoscopy. Routine leak tests by contrast X-Rays are often misleadingly normal.